9183-KS-DST is rated 4.4 out of 5 by 37. Rated 5 out of 5 by Martyrr from Be sure to get detailed cartridge replacement instructions! Love the faucet, but handle kept falling off after a few months. Tightening worked for a while, but I didn't know it was a self-tapping screw so re-tightening only helped temporarily, as threads were getting stripped, likely by over tightening. Delta sent new cartridge unit but directions were sparse, leaving out a few important directions like hand tighten plus 1/4 turn (Delta rep told me this on my 2nd call). YouTube geniuses all used tools, tightening more than that and leaving teeth marks (or stripping soft screw-in collar like I did). Delta part instructions did not include the "line up the pins when you put in the new cartridge and make sure it doesn't turn while installing the locking collar". I allowed it to turn, tearing the delicate blue gasket that lines up with the internal portion of the valve. Delta graciously sent me a second valve and collar...but my lesson was to make sure you get really detailed instructions from Delta if you're if you're an overconfident knucklehead like me. I was not the family hero with the kitchen sink and dishwasher down for days awaiting the new valve. Loved the Delta reps, love the faucet. Just a learning experience for me. 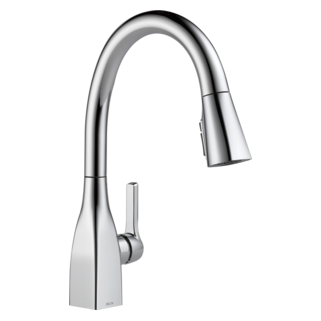 Rated 5 out of 5 by Dragon52 from Excellent Quality & Design It has been about a month since I installed the faucet. Install was effortless and performance has been what I expect from Delta, excellent. Rated 5 out of 5 by D and R from Great Faucet We went to a local plumbing supply store looking for a new kitchen faucet, to replace one from another brand we had only 5 years, and weren't that satisfied with. 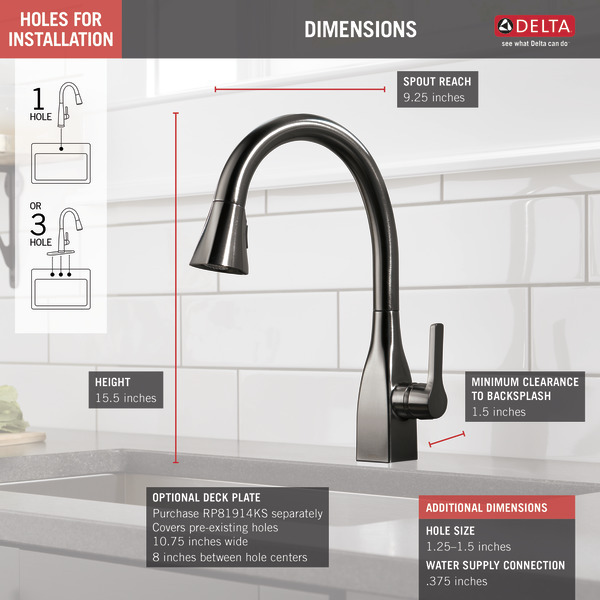 The Delta faucet came highly recommended from the staff. 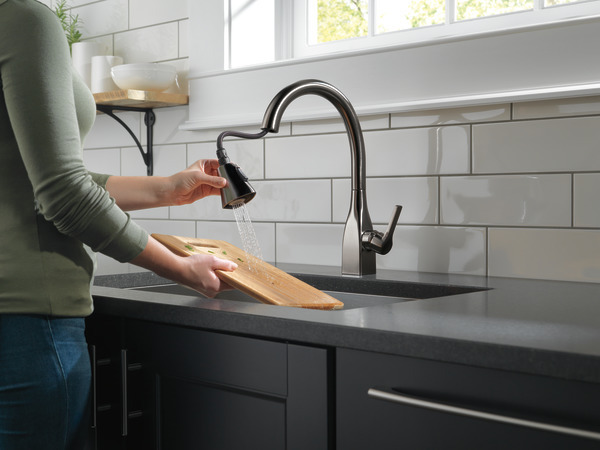 We liked the style of the faucet, and the fact it was well built. We've had it in use for several weeks now and are very satisfied with this faucet. It works very well, and the water flow from it is outstanding. Very good faucet, and we are very glad we choose this one. 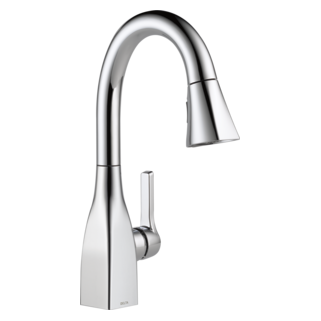 Rated 5 out of 5 by David from Beautiful faucet with very usable functions. Beautiful faucet with very usable functions. Rated 3 out of 5 by Grandpa from Slow-mo Great faucet, but too many water limiters. Water flow is abysmal. I'm an old man with prostate problems and my flow is better than the faucet. 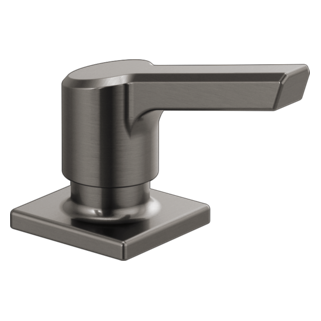 Rated 5 out of 5 by Speedy from Great solid pull down faucet The color of my faucet is a beautiful venetian bronze with copper tones. 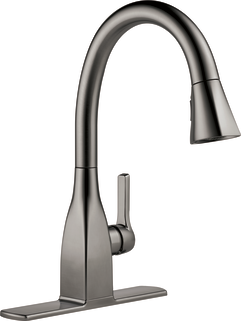 The faucet handle is very snug and the spray unit is very easy to clean. I am very pleased with the color and outstanding construction of this unit. Rated 5 out of 5 by NS68 from Nice faucet Bought this faucet for our newly remodeled beach house. Love the sleek look and size. Have only used it for two weeks and the only downside is the pitch of the faucet. The water does not flow straight down but a little toward the front of the sink; even with that I still like it. Rated 5 out of 5 by Wayne from Mateo kitchen faucet bought and had this installed in our counter top about 10 days ago. it fits into the decor and functions well. do you offer a drinking water faucet in this style with a black stainless finish? I don't see anywhere in your information how to add a soap dispenser to the installation. It seems that the escutcheon plate covers all three holes in the sink. Does the escutcheon plate have knockouts or do I have to get a sink with 4 holes? Can I purchase an AC adapter for this product so I do not need batteries. 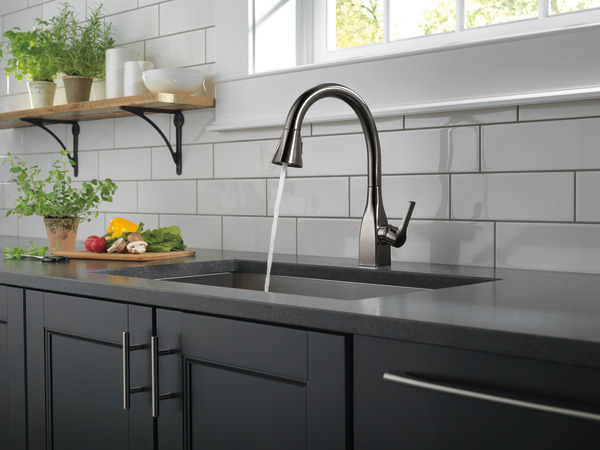 is there a soap dispenser style that goes with this faucet? When changing from regular flow to spray....can you press the button again or must the faucet be turned off? Will Delta offer the Mateo in Matte Black finish in the near future? Hi. Our faucet was just installed, but I'm not sure about the &quot;swivel&quot; of the faucet. It seems to swivel VERY easily back and forth and I'm not sure if it's supposed to, or if it could be loose. Any feedback would be appreciated. Does this faucet ship with the 3-hole adapter?